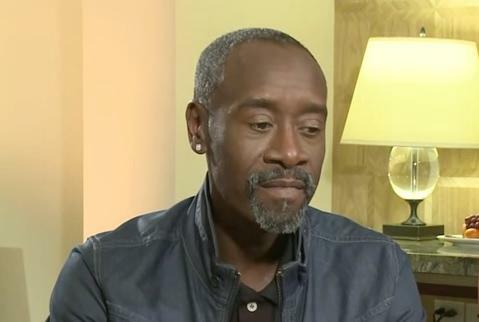 *Tomorrow, Tuesday, April 5 on “The Real,” co-host Loni Love sits down with acclaimed actors Don Cheadle and Emayatzy Corinealdi, who play husband and wife in the film “Miles Ahead,” based on the life of jazz great Miles Davis. Cheadle who also wrote, produced and directed the film, and Corineadli drop secrets about how they made their steamy love scenes look so realistic for a film that took almost a decade to complete! Loni Love: Tell me about the love scenes. Loni: [putting her hand on Don’s shoulder as if to help him sit back down.] Were the love scenes like awesome? Emayatzy: I’m gonna tell the truth. Are you ready for the truth? Don: I don’t know. But, tell it. Emayatzy: They were really lovely for me because Don really made me, really made sure to take care of me, you know. He made me comfortable. Emayatzy: I didn’t feel, you know [laughs] . Loni: I’m sorry, keep talking, girl. Don: You sayin’ it, girl. Keep going. How did he make you feel comfortable? What did he do? Oh, my God…what? Emayatzy: We’re women. This is important stuff. Loni: Let us have our moment. Emayatzy: It was very easy, you know. He really made me feel comfortable in those moments. That allowed me to just be in the moment and to go with everything, you know. And it just was just really lovely, really lovely. Plus, co-host Tamar Braxton fangirls over rapper 2 Chainz and chats about her love of “twerk driving” to his music. 2 Chainz also shares why this album, entitled ColleGrove, in his first with his face on the cover.